This document is designed to be stapled together or created into an A3 booklet. 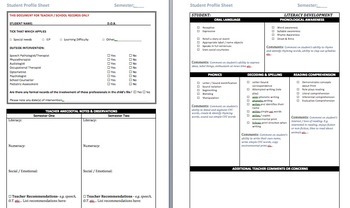 It has an student overview on the cover, with important data noted regarding intervention, special needs and spot to collate your summative notes and observations at the end of each semester. The next two pages are dedicated to Literacy and Mathematics. Here you are able to make quick records of a child's development. It is in a word document so that you can edit to suit your needs. DOWNLOAD THE FREE PREVIEW BEFORE YOU BUY. •	This document is designed as a teacher and school reference document ONLY. It is not for viewing by parents or to send home. •	The Literacy and Mathematics pages that follow do not need to be completed in full. I suggest you tick the boxes to show you have no concerns regarding the achievement of these outcomes and highlight those that you consider an area of focus. •	Only make comments if you need to – do not feel you need to write a comment in every box for every child. 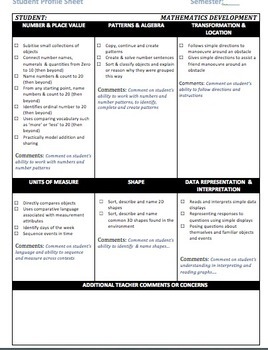 •	You may even use this as an intervention sheet and only highlight areas of concern and use the comments box to suggest activities you would like to do with the child in the future. Again, this can be used to guide discussions at parent teacher meetings or with other professionals. •	Be sure to circle in the header, whether the records are for Semester 1 or 2. I suggest printing off a new version for Semester 2.